—Bazaar, Donkey Kong Country 3: Dixie Kong's Double Trouble! 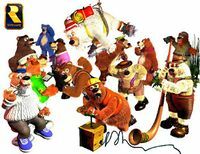 The Brothers Bear are a family of bear brothers who live in the Northern Kremisphere in Donkey Kong Country 3: Dixie Kong's Double Trouble! Each of them have their own establishment, a unique personality and role. Most of the Brothers Bears have a Banana Bird, which Dixie and Kiddy Kong can usually obtain by providing them with a unique item. Every Brothers Bear's name starts with the letter "B". The Brothers Bears all reside in the same type of cabin, which only differs by color scheme and small cosmetics. In the Game Boy Advance port, each of their cabins are completely redesigned and look entirely different from each other. In the Game Boy Advance port of Donkey Kong Country 3, a new bear is added to the Brothers Bear, named Bachelor. He appears in Lake Orangatanga, as Barnacle was moved to the port-exclusive world, Pacifica. In Donkey Kong Land III, there is only a single Brothers Bear, who is simply named Bear. Bear operates the Sheepy Shop around the Northern Kremisphere, where the Kongs can play Memory, pay two Bear Coins to hear a hint, or pay five Bear Coins to teleport to another area in the world map. Barnacle is the only Brothers Bear to reappear in the Japan-exclusive Donkey Konga 3: Tabehōdai! Haru Mogitate 50 Kyoku. There are 13 Brothers Bears in Donkey Kong Country 3 (14 if counting Bachelor from the Game Boy Advance port). ↑ "Dixie and Kiddy won't lack for help on this adventure. Besides having the Kong clan in their corner, they'll also meet up with a family of bear brothers–thirteen of them, to be exact–during their travels. Some will sell you items, some will give you advice, and still others will just give you a hard time!" - Donkey Kong Country 3 Player’s Guide, page 10. * Exclusive to the Game Boy Advance version. † Barbos's Barrier was moved to Pacifica in the Game Boy Advance version. This page was last edited on April 9, 2019, at 16:41.